Located on the hills that descend from the interior of the province of Pontevedra towards the Ría de Arousa, Valga is a municipality full of historical and natural heritage. The birthplace of nineteenth-century dancer Carolina Otero, “La Bella Otero”, holds several sites of great interest, of which today we will visit two: the petroglyph of Pedra da Serpe and the Raxoi waterfall. One of its oldest attractions is the so-called Pedra da Serpe (Stone of the Snake) or petroglyph of Campo Redondo. It is located on a hill near the village of Os Vilares, which can be accessed only by forest tracks that, while well preserved, are more appropriate for hikers, cyclists or cars prepared to tackle rough roads away from asphalt. Getting to it is, regardless, very easy from the centre of Valga, since that’s where the signs that will lead us to the monument itself start. The stone stands by to one of those tracks, well signalled. It is a granite outcrop that, among gorse and ferns, seems to even shine at certain times of the day. Its location probably wasn’t random, since from this site you get wide views of the Valga valley and the imposing Mount Xesteiras, in Cuntis, a mass easily recognizable from dozens of kilometres around due to its height and the ball-shaped weather radar that crowns its peak. 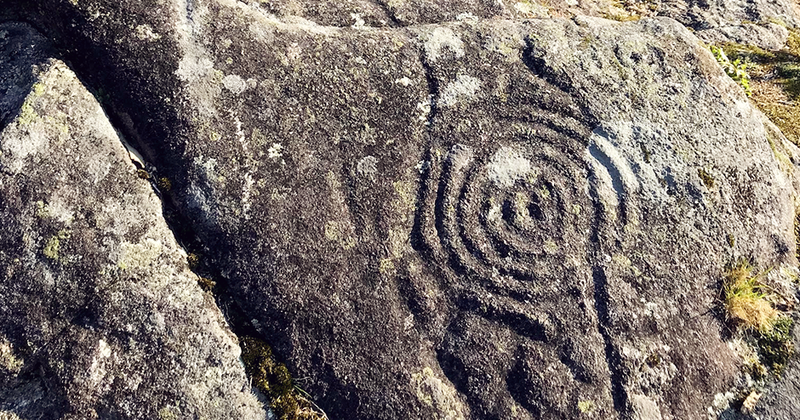 In Pedra da Serpe, the authors carved geometric patterns and concentric circles similar to those of other petroglyphs in the area, but what is surprising is the wavy vertical markings that mimic a snake’s movement. Its real meaning and the reason why they were drawn here has been lost in the mist of time. A little further down, taking advantage of the ferocious waters of the Valga River, you can find the ethnographic group of the Parafita mills, with an attraction that awes during the rainy season: the beautiful Raxoi waterfall. You can get there by taking the same road up the hill from the centre of Valga, and it is also very well signalled. In this place, the river compresses and descends so quickly (it drops 50 meters in height along less than 200 meters in length) that it forms several falls, of which this one is the most prominent. Wooden footbridges make taking in this spectacle easier. The mass of water springs from up high, rushing furiously onto a pool and, then, racing fast downstream. Following the trail you can ascend, with caution and some effort, to the top of the waterfall and follow the Valga river upstream. The contrast between the tranquility you feel in this place, along a path surrounded by vegetation and punctuated by tweeting birds, and the roar of the falls a few meters below is quite odd. The great force of the river in this section made mankind take advantage of the flow to build mills that, pushed by the strength of the water, were used to grind grain. Many of them have been reconstructed and are well cared for in this area, allowing visitors to understand how they operated and giving the place a delicious sense of the past.